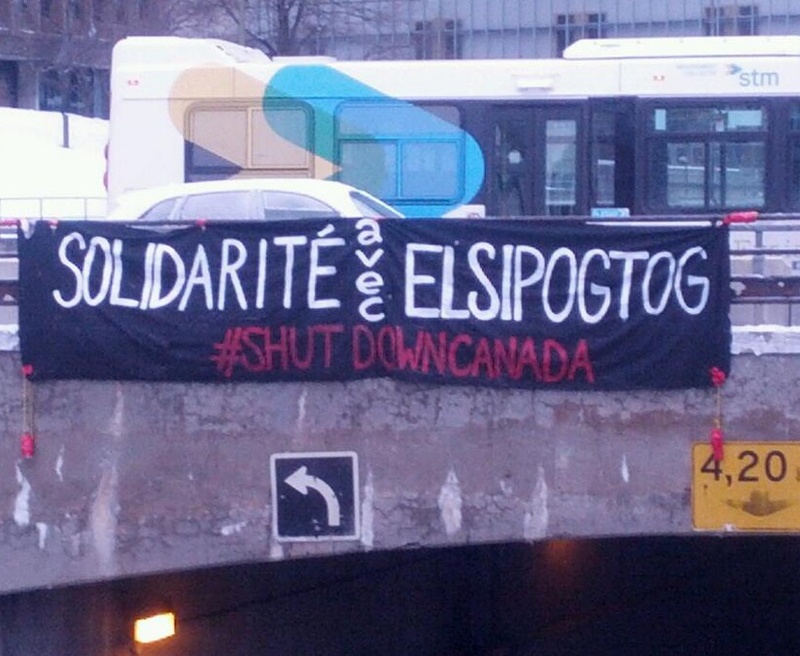 Banner drop in Montreal, Dec 2, 2013. The December 2nd day of solidarity with the Mi’kmaq anti-fracking resistance saw blockades, rallies, and banner drops across the country. Blockade of Port of Vancouver main entrance in Vancouver, BC, Dec 2, 2013. 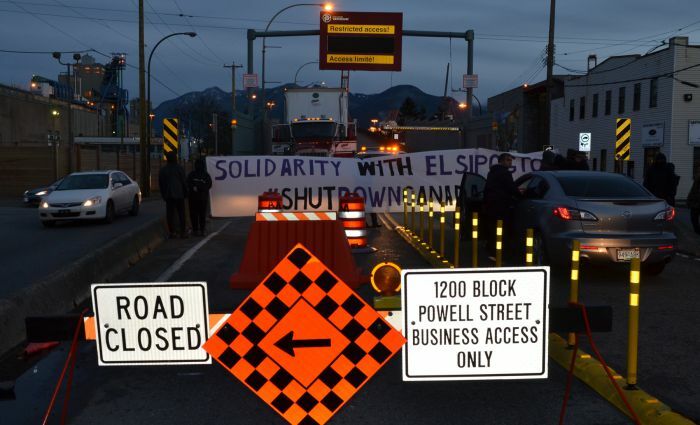 On the west coast, in Vancouver, warriors, anarchists and activists blocked the main entrance to the Port of Vancouver at around 7AM. The blockade was maintained for approximately one hour and dispersed once police began to mobilize a large force of cops. In Montreal, one person was injured after a motorist drove through a blockade of a major intersection in the city. Several banners were also dropped throughout the city. In Hamilton, Ontario, hundreds of Mi’kmaq solidarity posters were pasted around the city and several banners also dropped. Rallies were also held in Victoria, BC, as well as Winnipeg, Toronto, and Ottawa. 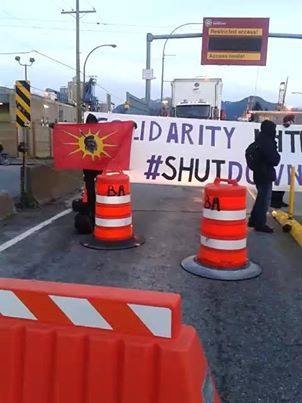 Port of Vancouver blockade, Dec 2, 2013. 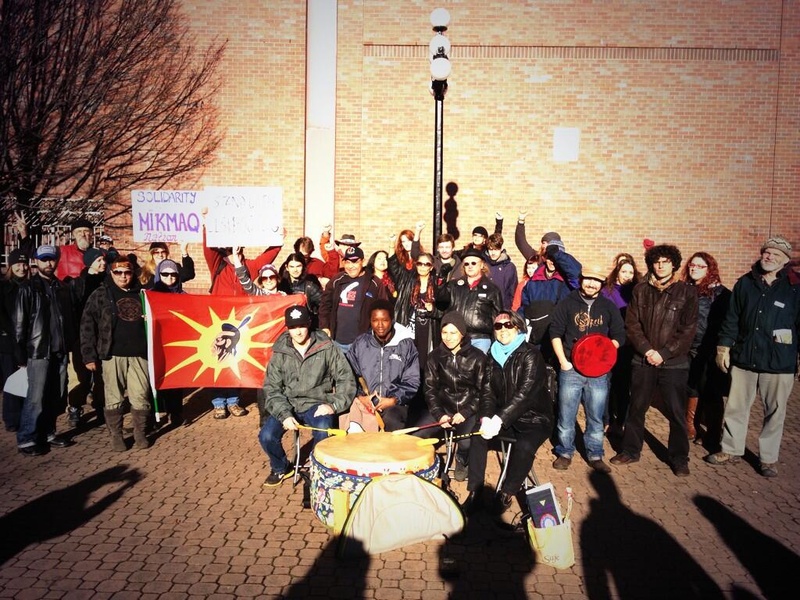 Rally in Victoria, BC, in solidarity with Mi’kmaq, Dec 2, 2013. Protest “photo bombs” CTV Toronto, Dec 2, 2013. 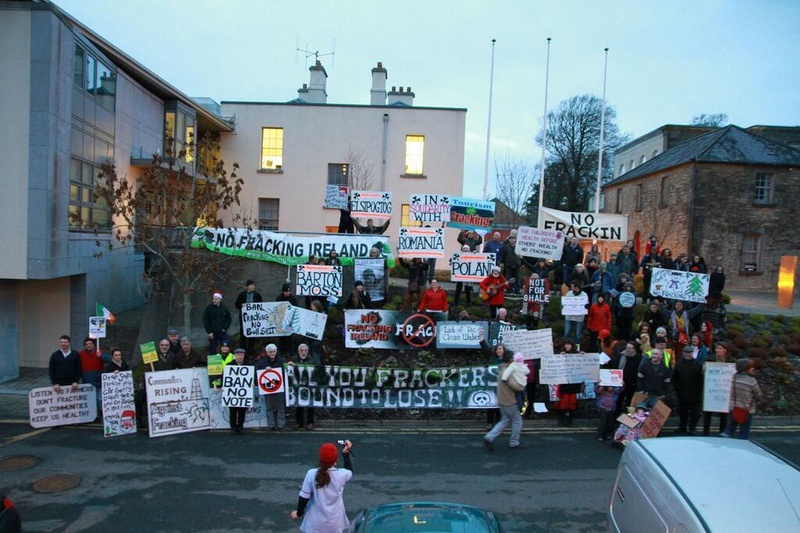 Solidarity rally against fracking, Ireland, on Dec 2, 2013. Banner drop in Hamilton, Ontario, Dec 2, 2013. 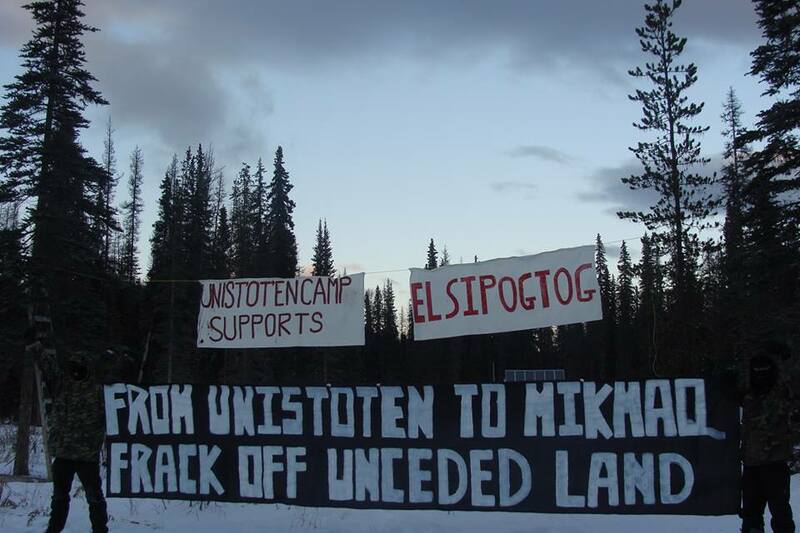 Banners at the Unist’ot’en camp, Wet’suwet’en territory, Dec 2, 2013. 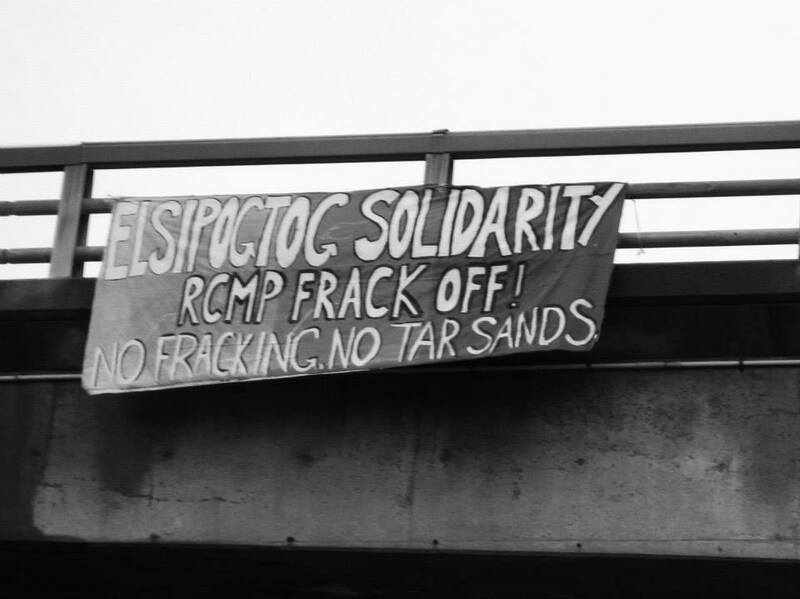 Posted on December 3, 2013, in Oil & Gas and tagged #shutdowncanada, anti-fracking New Brunswick, Elsipogtog First Nation, Elsipogtog solidarity, fracking, Indigenous resistance, Mi’kmaq, native protests, SWN Resources Canada. Bookmark the permalink. 5 Comments.